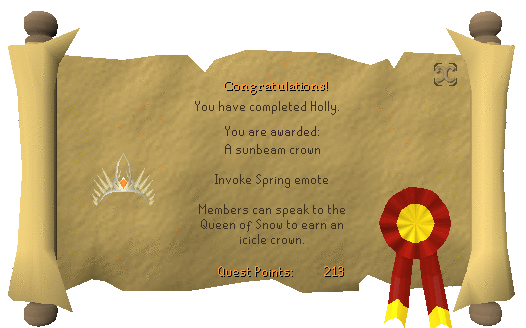 This year's Easter event was released on 19 April 2011, and involved the Queen of Snow and Queen of Sunrise. Can you help the make sure the traditional ceremony of changing seasons goes well? Spring has sprung – the birds are singing and the sun is starting to shine – but there's still an unseasonal chill in the air. This could well be related to the ceremonial handing over of the 'Year', in which the Queen of Snow officially passes on the season to the Queen of Sunrise. For this year's ceremony, the queens have agreed to 'do battle' with evil holly and hawthorn trees. Note: This event was only available from 19 April 2011 until 2 May 2011. Speak to either the Queen of Snow or the Queen of Sunrise in the Land of Holly and Hawthorn. Teleport to Falador, and then run south. Teleport using an Explorer's Ring 3 or 4, and then head west. Teleport to Draynor Village with a charged Amulet of Glory and then head east. Teleport to your Player Owned House if your house is in Rimmington. 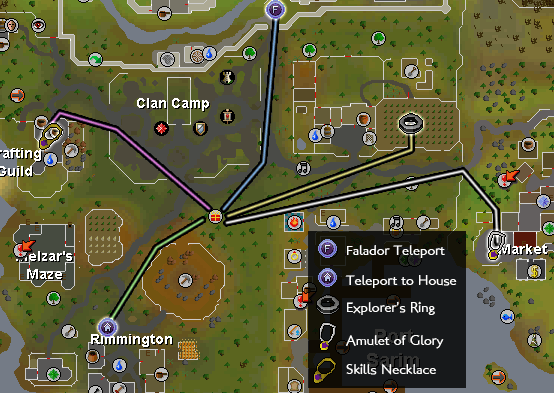 Teleport to the Crafting Guild using a Skills Necklace and then head southeast. Once inside, speak to the Queen of Sunrise near the bank. Ask her if she has a task for you, and she asks you to chop down an Evil Holly Tree and bring her some Year. She tells you that the Easter Bunny will give you a bronze hatchet and a tinderbox. To start an Evil Holly Tree, find some saplings and nourish them. If you don't want to do this, you can always search around the area for an already-active Evil Holly Tree and help chop that down. To help defeat it faster, cut some Evil Roots that appear around the tree and light them on fire. Note that it will also die faster if you use a more powerful hatchet such as a rune hatchet. After the tree has fallen, search it to find a Year. Bring this to the Queen, and you enter a cut scene. You learn that the Year doesn't work and it isn't the true year. Stone Spirit - Climb up the stone stairs in the north-east corner. Cloud Spirit - Climb up the stone stairs in the north-west corner. River Spirit - In the south-east corner beside the waterfall. After a collection of interesting conversations, each of them will give you a key. Head over to the south-west corner and search the rock in the river. You find out that it is blocking the entrance to the tunnel. Use your stone key on the rock, and the stone disappears. Enter the cave that you unblocked and make your way to the end of the passage. Use your water key on the bubbles in the pool and the water drains away. Climb down the wall and enter the cave that was hidden by the water. Run to the end of the passageway and use your cloud key on the steam cloud. The cloud carries you up a chimney and you appear in the last cave with the Queen of Snow. Talk to her and accuse her of stealing the Year. She says that she's a creature of winter and can't perceive anything else. Pick up the hammer and chisel in the room and use it on the tall ice block. Choose any of the options (yes, even the last one!) and talk to the Queen of Snow where you will enter a cut scene. She agrees to let go and explodes into snow. Go back to the Queen of Sunrise and give her the true Year. Another cut scene will pass. Congratulations, you have completed the event! But wait... it's not quite over yet! 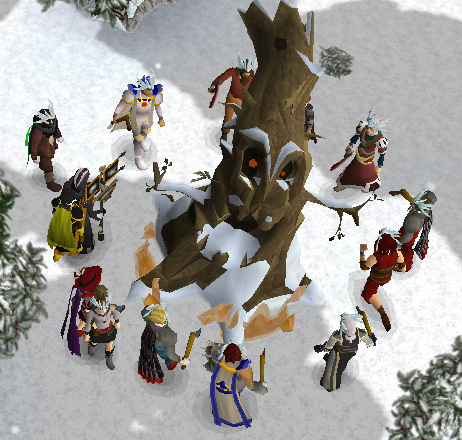 If you are a Member, talk to the Queen of Snow and she will ask you to chop down an Evil Hawthorn Tree. Like your previous encounter, chop it, search it then go back to the Queen of Snow. 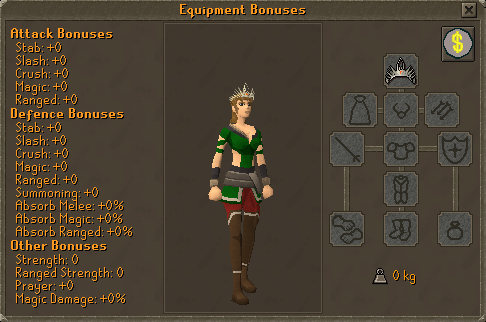 You receive an Icicle Crown. She tells you that if you kill additional Evil Hawthorn Trees, the crown will get charges and can be used to find out where Evil Trees are.